Average 7-9 inches. Coastal cutthroat can grow to 10-18 inches in quality populations. Resident coastal cutthroat trout are one of three subspecies of cutthroat trout that occur in BC and one of the two that are native. The other native is the westslope. There is also an anadromous, or ‘sea-run’ coastal cutthroat. The coastals have dark green backs with olive sides and silver bellies along with numerous irregular spotting over their entire body, including below the lateral line. 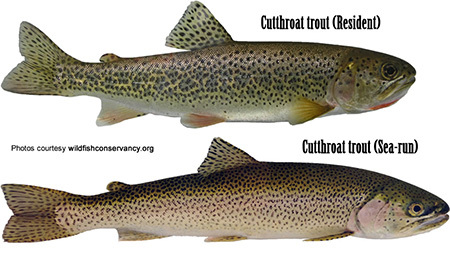 Resident cutthroat trout can be mistaken for rainbow trout, but they have two distinguishing features that rainbow do not: the underside of the cutthroat’s lower jaw has red slash marks on each side (where it gets its name from) and small teeth on the back of the tongue. The cutthroat's upper jaw also extends past the back edge of the eye, where is does not in rainbow (except for rainbow over 20 inches). The resident form of coastal cutthroat trout are widely distributed throughout BC (west of the Rockies). They are also present in lakes, along with tributaries to the ocean, coastal streams, and in tributaries of the lower Fraser River. Although a resident cutthroat trout may be found throughout a stream, the majority of them are found in small headwater streams above impassable barriers. Stillfishing and trolling are two popular methods used to fish for resident coastal cutthroat trout. In addition to bait, resident coastal cutthroat trout can be caught using a wide variety of artificial lures and flies. In freshwater, they live in clear, cool water in coastal streams, pools and tributaries of small rivers. In the ocean, cutthroat feed and shelter in estuaries, tidal lagoons and marshes. They generally stay close to shore in protected areas. Eelgrass and kelp beds are prime Cutthroat Trout habitat, as they host a wide variety of prey species, and provide shelter. Cutthroats as a rule like big meals and their preferred diet consists of salmon fry, sculpins, stickleback, and smaller trout. In waters that don't contain these big morsels they survive on the usual trout fare of chironomids, leeches, and various nymphs and adult insects. They are a true opportunist and will often take a big offering even during a hatch of other insects, yet they can sometimes be as selective a quarry as any other fish. Cutthroat Trout can generally be found along shorelines with eel grass, oyster beds or rocky bottoms within several miles of a stream mouth. Places with boulders, points, current rips or back eddies are also productive places to search for these fish. One feature of coastal cutthroat that makes them especially appealing to fly anglers is that are typically found fairly close to shore and are usually well within the reach of shore bound fisherman. The best time of the year to fish for cutthroat is from early Spring through Fall, with the months of September and October typically producing some of the best fishing of the year. To fly fish for Cutthroat off the beach a 9 foot 5 or 6 weight fly rod with matching reel spooled with WF or intermediate sinking line and 8 to 10 feet of 4 pound leader. Long casts and quick retrieves are the norm. The quick strip retrieve is important to remember. Since Cutthroat Trout prey on minnows and fry they expect their prey to be moving quickly to try to escape. Strip your fly quickly and maintain that speed. Sometimes a trout will follow the fly a good distance, often creating a slight wake behind it. Fly fishers will want to “match the hatch” and some popular types of fly patterns are nymphs, streamers, and dry flies. Fly patterns such as the Mickey Finn, rolled muddler, marabou clouser minnow, Royal Coachman, Professor, and any other fly pattern that mimmics a minnow will work for Cutthroat trout. Spincasting off the beach also can be a productive method for Cutthroat. Your fishing tackle should be on the light side. Use ultralight spinning gear loaded with 4 to 6 lb. Test line. A wide variety of ultralight spinners and spoons will work. Tiny Mepps spinners or Panther Martin spinners or tiny spoons in most colors will work, especially red and yellow. Fishing with a wet fly can be deadly, on both spin or flyfishing gear. Spincasters should use a casting bubble or pinch some splitshot 16 to 24 inches up the line from the fly. Hopefully the information provided on this page will make you more successful at catching trout. However, you may still want to expand your research on trout fishing and look into additional resources. That’s why I’ve provided you with additional places below where you can learn more about trout fishing. If you found my trout fishing tips useful then please share my website with your fellow anglers, friends, family and co-workers.